Don’t let connectivity keep you from accomplishing greater things! Say goodbye to dropped calls and pave the way to a happier home or a more productive workspace with the Home 4G Cellular Signal Booster from weBoost! 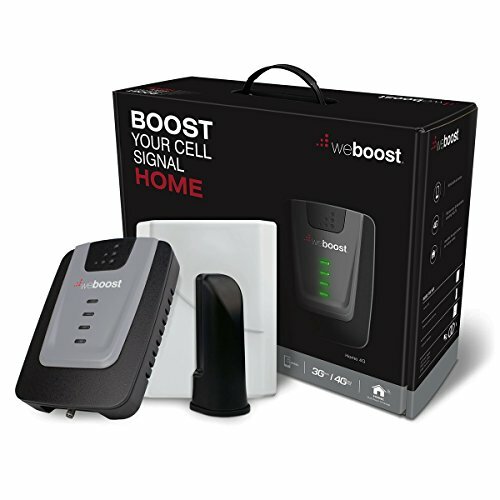 The weBoost Home 4G is our most affordable 4G cell phone booster for home and indoor coverage. Designed to improve communication lines at your home or office, this device enhances 4G LTE and 3G signals in buildings of up to 1,500 square feet. The Home 4G from WeBoost can power up your cell phone signal in 1 or 2 rooms of your home or workplace. It ensures better voice and data, fewer dropped calls, higher voice quality, and faster uploads and downloads. Equipped with a patented smart technology that senses signal conditions in and around the building, this innovative technology electronically optimizes the booster’s performance. The Home 4G works with all carriers in the United States and Canada: AT&T, T-Mobile, Verizon, Sprint, Straight Talk, and U.S. Cellular. No matter what carrier you use, it is guaranteed to increase the signal strength of any cellular device, giving you crystal clear calls and uninterrupted data. The package includes the Home 4G, an indoor antenna, an outdoor antenna, a power supply, and a 30-foot coaxial cable. You’ll experience easy and convenient installation of your booster when purchasing this complete pack! Our products come with 7-day support and a 2-year warranty. Our highly trained technical staff will provide you with any assistance you need to get familiar with and use the device. We guarantee this booster will give you unmatched network reach, but if you still aren’t satisfied, we will be happy to fully refund you within 30 days of purchasing. Invest in the weBoost Home 4G Cell Phone Signal Booster risk free and experience faster internet browsing and less dropped calls today. STOP DROPPED CALLS: Boost 4G LTE and 3G cell phone signals in your home and office. Use for peace of mind while on important business calls and while speaking to loved ones. With a signal boosting range of up to 1500 sq ft this device extends your existing cellphone coverage in one to two rooms. The booster simply amplifies your existing signal to give you more bars and maintain fast data speeds while you browse the internet or talk on the phone. WORKS WITH ALL U.S. CARRIERS: Verizon, AT&T, Sprint*, T-Mobile, Straight Talk, U.S. Cellular and many more. If you have a cell phone plan with any of the above carriers, this booster will work for you. Guaranteed to improve your existing connection across multiple devices simultaneously or your money back. *Government regulations in the U.S. & Canada prohibit boosting a particular frequency used by some of the Sprint network. Most Sprint customers still see performance improvement from weBoost signal boosters. FRUSTRATION FREE SET UP: The simple instructions and DIY installation make it easy to get your new booster set up and working quickly. All of the components you need for installation are included in the package with easy to read, step-by-step instructions. Some users report being able to set up the entire kit in as little as 10 minutes. AUTOMATIC GAIN SETTINGS: The weBoost Home 4G booster uses patented smart technology to sense nearby signal conditions and electronically optimize the booster’s performance. The device provides a maximum signal gain of 60 decibels. This means that your booster will always optimize to provide you with the strongest signal and connection to keep your bars up and browsing speeds fast.